A little while ago I was lamenting with my Literature class that it wasn’t always easy to document how that class went and establish what to do next, both of which are critical for effective planning, reflection, and formative assessment practice. I take notes on student progress (formerly in OneNote, latterly in Evernote) but it takes discipline (and time) to do that after every lesson, let alone in that lesson itself. I might do that once a week, so I often don’t even have a record of who I’d had a good learning conversation with each lesson and, importantly, who I hadn’t spoken to 1-1 for a while in class. However, the lowest response came from the question: ‘Do you have a good sense of how you’re going in this class?’. It’s something that is difficult for Year 12 students sometimes, especially early in the year when they haven’t done much School Assessed Coursework (SACs) and it’s one place where a short 1-1 conversation can have much more impact than any general or group activity you set up. But, who have I spoken to recently? Is the problem I began with. So, I was very interested in the possibilities of the unlikely tool named Class Dojo which promises real-time behaviour monitoring. I saw the program from Roger Zuidema on Twitter and recorded that I was about to invent this! I was surprised to get a pretty quick reply from the people who make Class Dojo too, proposing a Skype chat sometime about how it could be improved, which I’d like to do sometime. How it works is you set up your class, who get zany colourful avatars, and you record good behaviour or bad in the class very easily via web page, iPad or iPhone. They get +/s or -/s against their name and the tally adds up. Over the lesson, or the week, or the term or whatever period you decide. I’m lucky to work in a school where disruptive behaviour is rarely a problem but I was very interested in how this tool might be used to record learning behaviours. 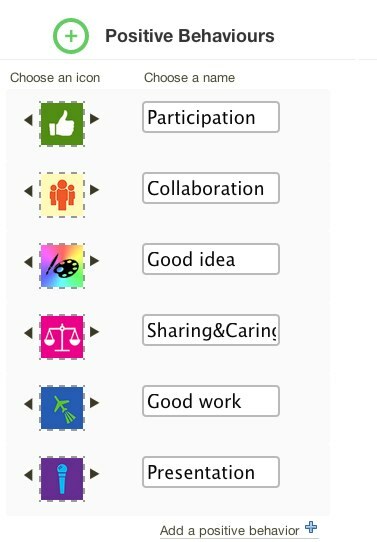 Our school’s reports, for example, include a set of ‘Positive learning behaviours’ from ‘Participates in class discussions’ to ‘Is organised and up to date with set work’ that teachers are asked to record in terms of how often they’ve seen their students exhibit those behaviours? Always, often, sometimes, rarely? 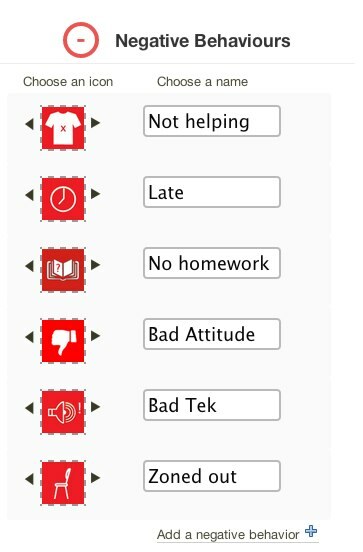 But how do teachers record those behaviours and could Class Dojo help? One of the first things I did was enter my students names and then showed them how the class looked via the data projector in class. They’re Year 12 students but they loved the quirky little pictures, immediately wanted to customise theirs (you can’t) or swap with someone else (you can’t). We then looked at the behaviours section, which is at the heart of the program. We looked at the default behaviours (out of chair!) and talked about what + or – behaviours might look like in our Literature class, and then added them. One of the nice things is that you can set the positive and negative behaviours yourself and can even vary them from class to class. So, I can set up a series of learning behaviours that suit my senior Literature class, which are different to the ones I want to establish with my tutorial group in the wellbeing program. Here’s the behaviours we agreed on. We agreed on these positive and negative behaviours and I was ticking off some of the things in Class Dojo through the class. This year I’ve started using a student as ‘class blogger’, who records the class discussions, rather than doing that myself all the time in OneNote, (they’re put up on the class wiki) and that’s helped free me up more to direct discussions or take records like this. So you click on the student names and assign ‘points’ as you go and it even pops up on the screen with a cool sound if you want. I don’t think our school would approve of zany colourful non-letterheaded reports being emailed to parents, but I was happy to send them to students, always in a positive way to celebrate some ‘points’ they’d gained during the class. I wouldn’t want this to be a negative thing, and I wouldn’t be showing negative scores a lot, or giving them I hope. But, ‘not doing the homework’ is a pretty clear – in a Year 12 year. Is it perfect? No. Is it a fun, simple and useful way to clearly document and share the good things that are going on in class? Yes. You need to have internet access and more importantly, your students on board; to involve them in the discussion about criteria and be clear and objective about how you’re using it: it’s not an assessment, it’s a tool for improving learning. I plan to keep using it with my Literature class and wellbeing class this term and see how it goes. I had the interesting experience of being home and online this week while the ACEC Digital Diversity 2010 Conference was on in Melbourne and for the first time I felt that I could be pretty connected the goings on from a distance. The Twitter stream coming out of that conference was detailed and reflective. I used Twazzup or a specific search column in Tweetdeck to keep up to date with what educators were thinking about live sessions, and even the official conference website incorporated the Twitter updates right up on their front page. It also helped that Steve Collis was live-streaming some of the sessions from his notebook computer. The audio was great and while I couldn’t read all of the PowerPoint slides that presenters were talking to, I could keep up very well with the presentations. And those presentations and thoughts aren’t lost in the ether either. Do a Twazzup search for #acec2010 and you can re-live some of the conversation and finds links to longer blog posts reflecting on the conference and resources like this page from Gary Stager. 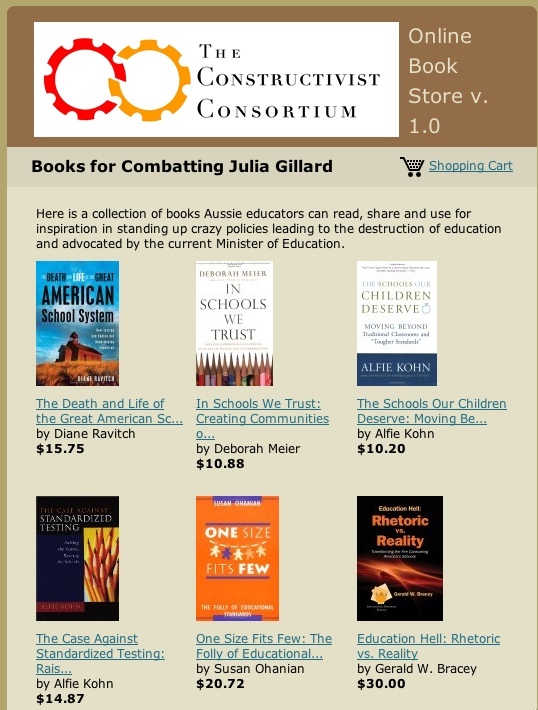 where I found his article debunking the New York influence on our current curriculum agenda and his Amazon list of books for combatting Julia Guillard. Nice stuff! And I could sneak out for a bike ride and check out the live surfing webcast from Bells Beach as well! Just arrived in Lorne this afternoon for the Expanding Learning Horizons 2008 Conference, which I’m looking forward to. I haven’t been for a few years so I’m looking forward to connecting up with old friends, making new connections, learning a lot and presenting with a colleague on online safety and ethics. I took the ferry across from Sorrento to Queenscliff, and drove down in the rain listening to This Week in Tech on the ipod to get in the mood. I hope to blog a little about the conference as it develops, or even send some twitter updates as well.